Dumas Bay Park in Federal Way-A nearly always empty neighborhood park. Follow a winding, forested path and emerge (like magic!) on a stretch of sandy beach. It’s a little tricky getting here mainly because you’ll pass a Dead End sign and go through a residential neighborhood. It’s o.k….keep going. Owens Beach, Pt. Defiance-Rocky beach but great for watching people and ferries! It can get crowded, but the parking lot and the beach are huge. You’ll have plenty of room if you go anytime soon. 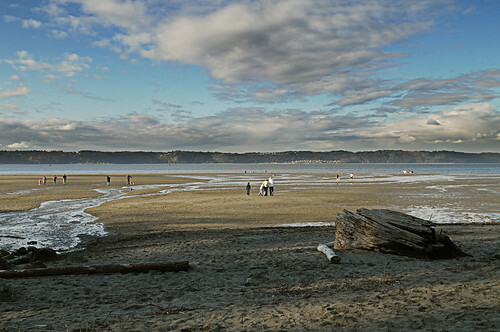 Kopachuck State Park, Gig Harbor-This is one of my old haunts. Locals fought to keep it open, and we should all thank them. Lots of great forest and trails to explore and prime shorefront. Rocky but fun to find crabs and other sea creatures. Salt Water State Park– Great beachcombing, and there is a good chance you’ll get to see scuba divers. Dash Point-Sand, Sand, glorious sand. You won’t believe you’re in Washington. Your kids will be in heaven. The campground and select trails are closed, but beach access is open. As always, you’ll have more fun if you check the tide tables first. Bring along plenty of extra clothes and stuff to help clean-up. Watch your kids around water and teach them to admire sea critters without disturbing them. Did I miss your favorite NW beach outing? Let me know! what beach is pictured on this posting? Is it dash point?